As we get older, we should really start taking care of our body. Not only our appearance but also our inner beauty. 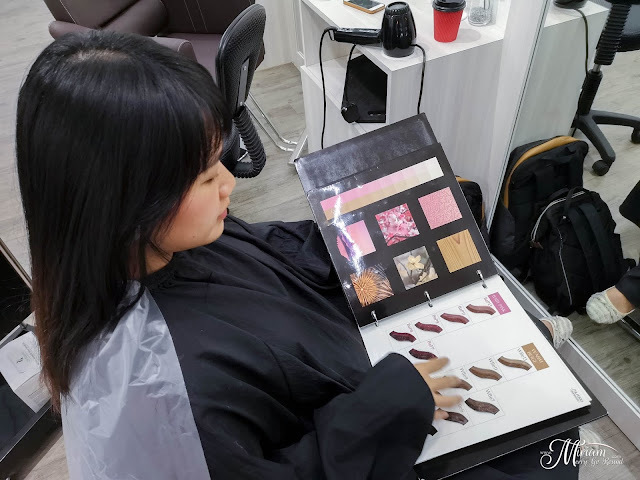 Many put a lot of emphasis on their personal appearance with the different skincare regime, hair care, cosmetics and etc. However, beauty starts with good health as your inner health will reflect on the outside too. Unfortunately, many of us young people don't really put emphasis on the importance of proper nutrition and we tend to neglect our body. I personally am one of those people who actually neglected my health until I landed in the hospital last year. Skipping meals, staying up late nights due to work commitments or over active lifestyle causes our body to age and weaken. 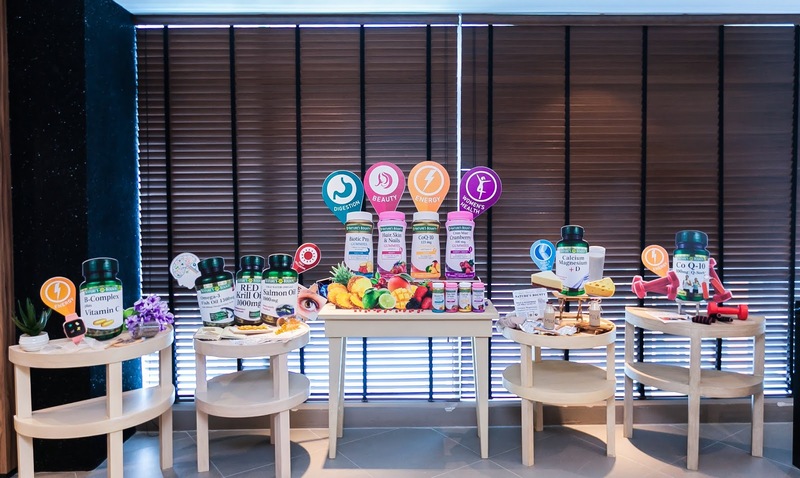 Good nutrition is key to a healthy life especially by keeping a balance diet and taking proper nutrients. 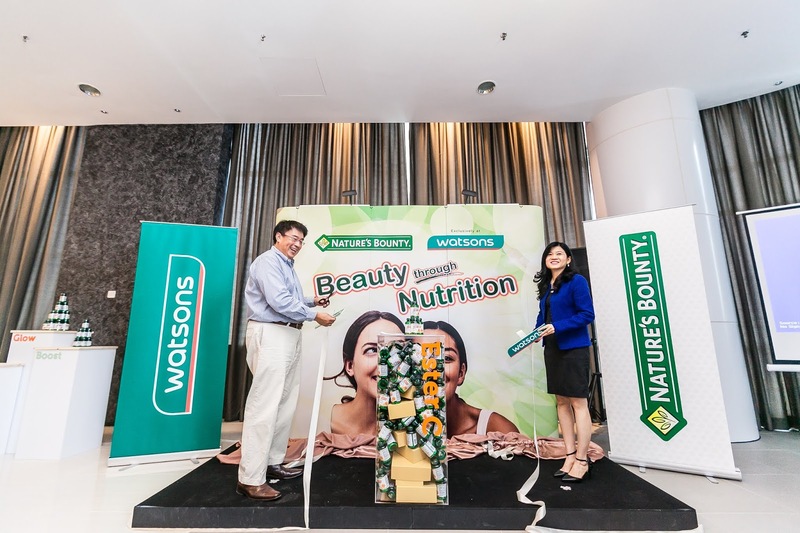 Nature's Bounty which is now exclusively in Watsons Malaysia emphasize on beauty from the inside and out. 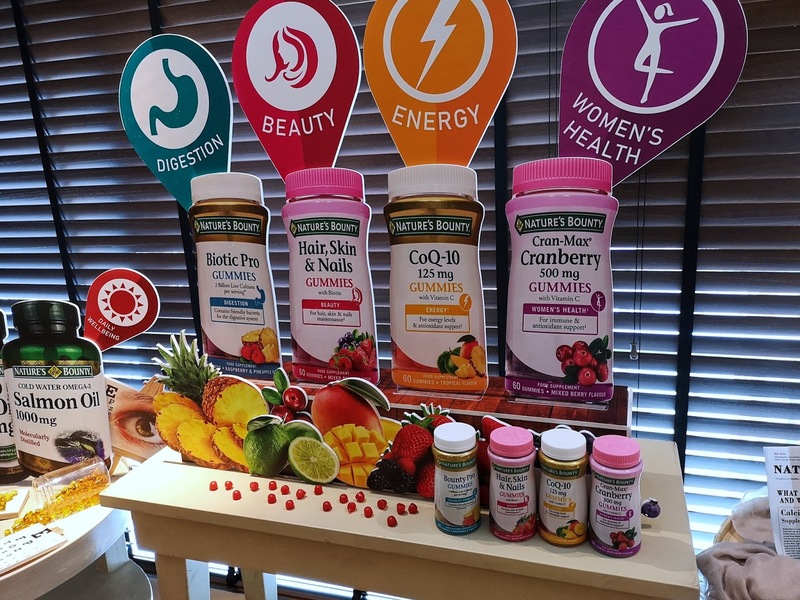 They believe that what you put on the outside is equally as important as what you put into your body. As much care as we have for our appearance, we should also put more care with the best nutrition. 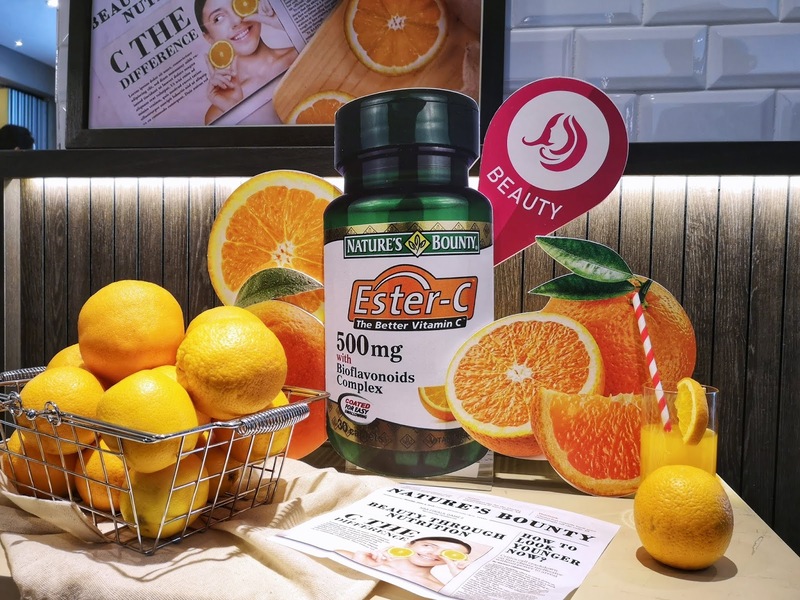 One of Nature's Bounty's best selling product is the Nature's Bounty Ester C. Uniquely patented form of Vitamin C that readily absorbs with long lasting effects to ensure what is taken is optimized in your body. 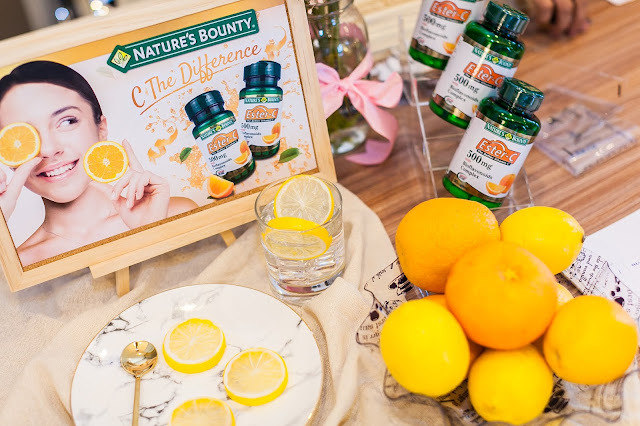 It's proprietary formulation ensures prompt delivery and superior bioavailability compared to regular Vitamin C.
Nature’s Bounty is the premium vitamin and supplement brand with a 40-year reputation for delivering high quality vitamins and supplements to consumers around the world. At Nature’s Bounty they are continually researching new ways to bring high quality innovative products to help people stay healthy, active and feeling great. 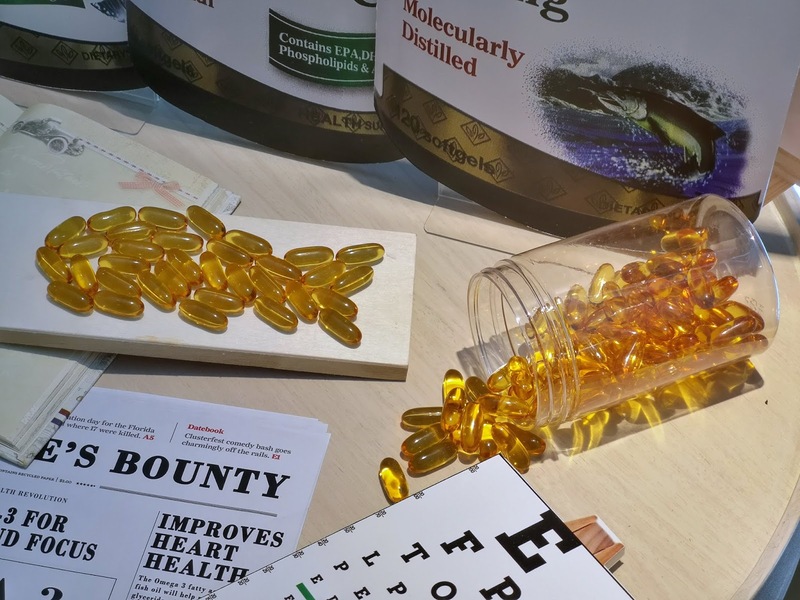 There is a wide range of supplements that they carry to tend to your required nutrient needs. Nature’s Bounty vitamins and supplements are manufactured in the USA with comprehensive testing of ingredients and over 100 quality checks throughout the manufacturing process. 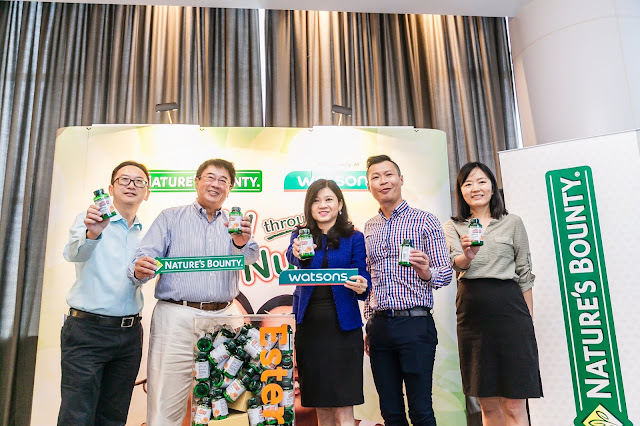 Consumers trust Nature’s Bounty because it consistently delivers outstanding quality, innovation, selection and value. 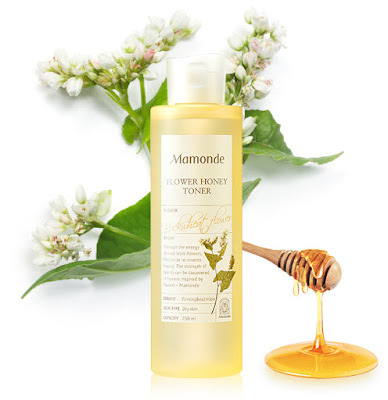 Ever since Mamonde entered Malaysia, I have been a huge fan of their skincare and cosmetic range. 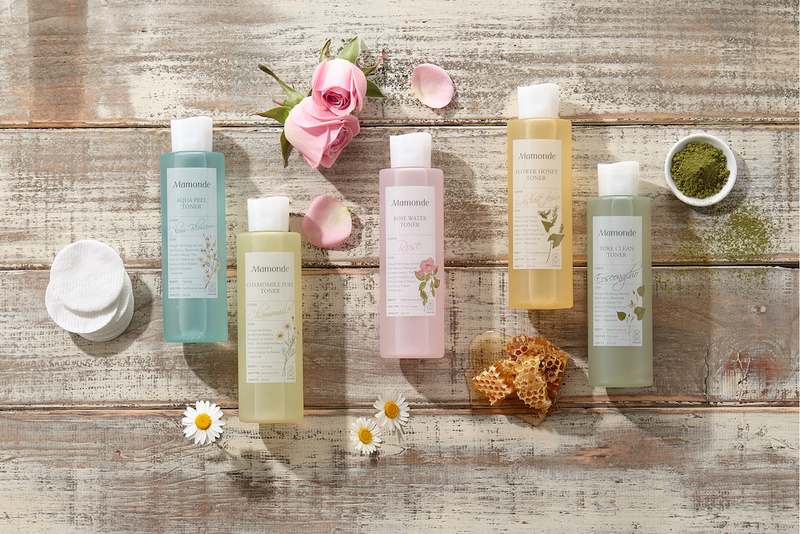 Inspired by beautiful flowers, their products are infused with the nourishing properties in selected flowers. 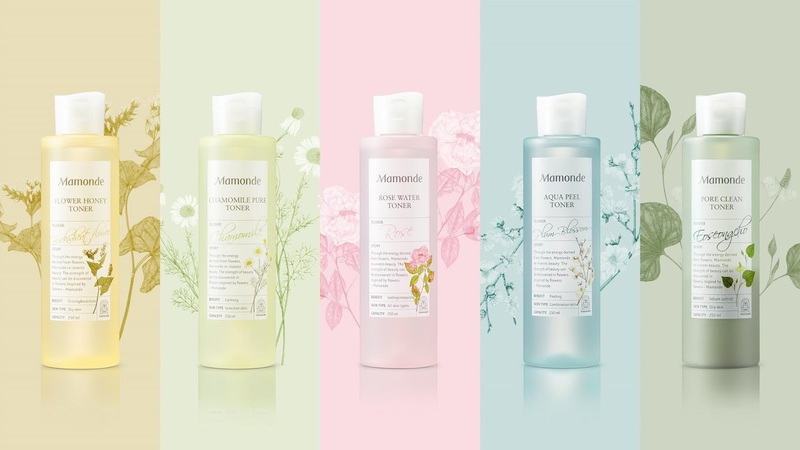 Recently, Mamonde launched their new Mamonde Flower Toner Series which is an expansion from the Rose Water Toner. 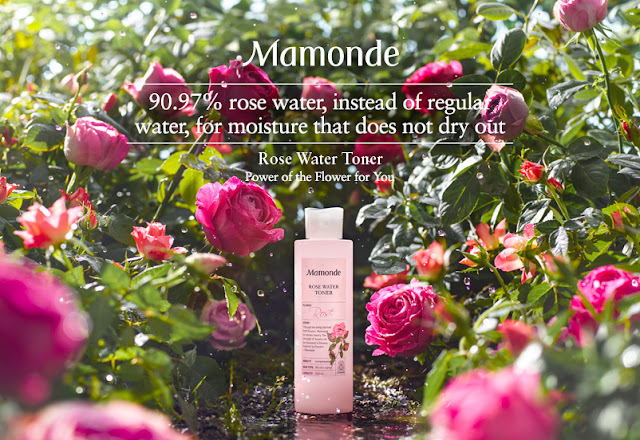 I love the Rose Water Toner which is suitable for all skin type but I was delighted to know that Mamonde continued to unveil the beauty of flowers by adding 4 NEW Flowers into their series. The latest Flower Toner Series is inspired by Damask Rose, Plum Blossom, Chamonile, Buckwheat Honey and Heartleaf Houttuynia. Each of the Flower Toners are formulated with flower-derived active ingredients to accommodate different skin needs. This is the original Flower Toner, infused with 90.97% Rose Water to provide excellent soothing and moisturizing care for the skin. 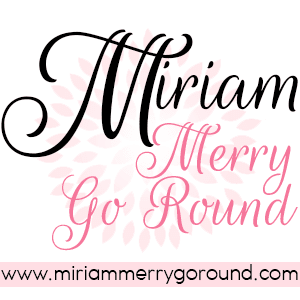 It absorbs into the skin immediately and softens rough, flaky skin to reveal a clear and vibrant complexion. Ideal for those with sensitive skin, Chamomile contains soothing properties that helps sooth and alleviates inflammation and roughening of skin. Hectic lifestyles, lack of sleep and constant exposure to harmful pollutants may trigger and cause our skin to be sensitive. 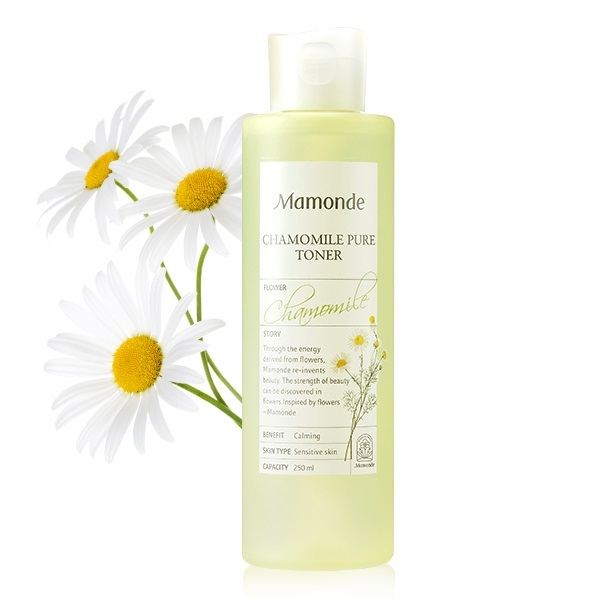 The Chamomile extract in this toner provides excellent soothing and moisturizing effect to the skin. Using the antioxidant properties in Plum Flower extract which is effective in moisturizing and purifying the skin, The Aqua Peel toner is suitable for dry and combination skin. 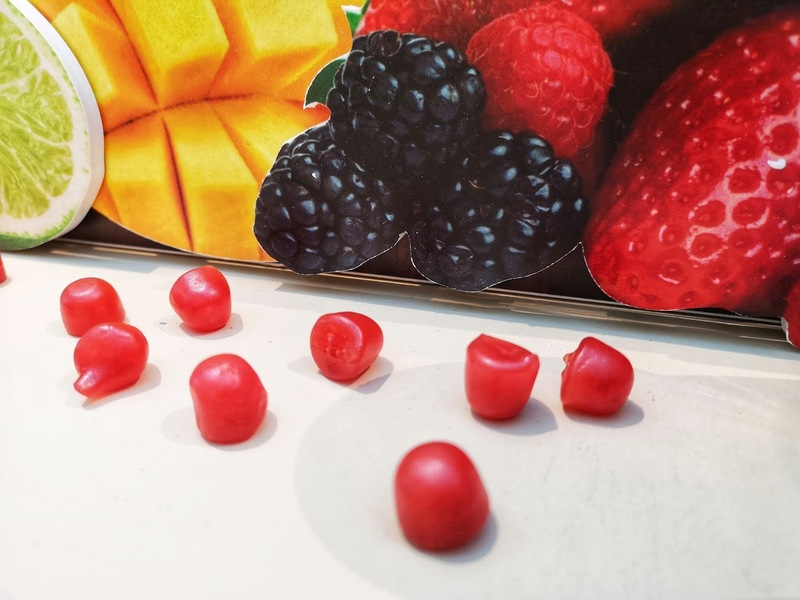 The components of the Plum macerate dead skin cells on the skin surface, while the plant-based enzymes stimulates the skin to exfoliate the skin effectively while still leaving the skin moisturized. An essence toner formulated with Buckwheat Honey, the Mamonde Flower Honey Toner helps nourish and firm up the skin by strengthening the skin barrier to improve skin’s texture and elasticity. It is also infused with Propolis (a natural homeostatic substance produced by combining plant sap and bee saliva), which functions to protects the skin from external stimuli with excellent anti-bacterial, sterilizing and anti-inflammatory effects. This toner is perfect for those with extreme dryness and have signs of aging. 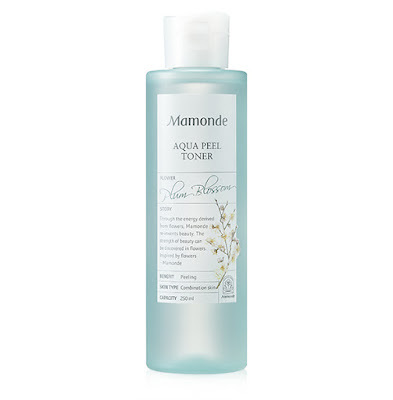 Infused with Heartleaf Houttuynia, a flower native to Japan which is widely used as herbal medicine due to its rich protein, minerals and vitamin B content, the Mamonde Pore Clean Toner is made for oily skin. The double layer toner is formulated with Eoseongcho tinture and mud from Korea's West Coast which helps control sebum and tighten pores. To use this toner, shake the bottle to mix the content together then use a cotton pad to gently sweep over the face. The Mamonde Latest Flower Toner Series can be purchase through the Mamonde Beauty Counters at Aeon 1 Utama, PJ, Aeon Mid Valley Megamall, KL, Parkson Suria KLCC, KL, Aeon Bukit Indah, JB, Aeon Tebrau City, JB, Parkson Gurney Plaza, Penang and Sephora stores located at Mid Valley Megamall, KL, 1 Utama, PJ, IOI City Mall, Putrajaya, Komtar, Johor Bahru, IMAGO Shopping Mall, KK and Nu Sentral, KL. It is also available on Lazada.com.my and hermo.my. 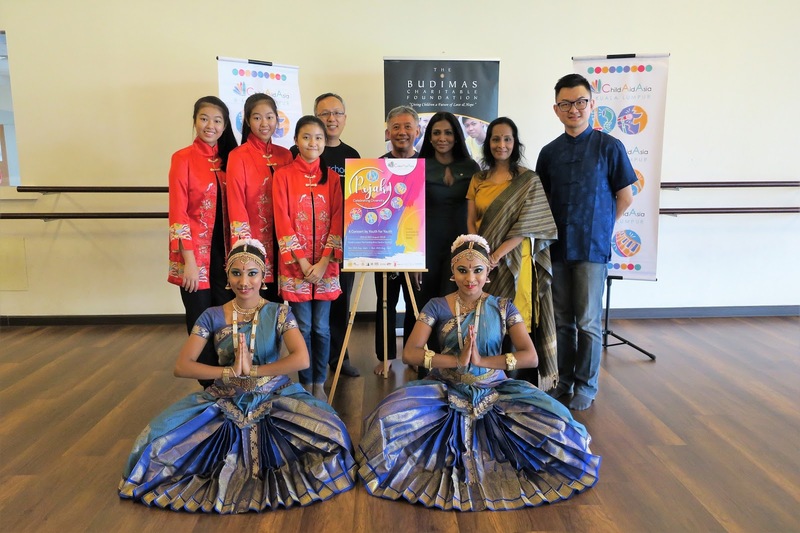 The Budimas Charitable Foundation and Suntory Beverage & Food Asia Pte Ltd are proud to be supporting the 6 th edition of the ChildAid Asia Kuala Lumpur’s (CAAKL) Concert series that will take place on the 25 th and 26 th of August 2018 at Kuala Lumpur Performing Arts Centre (KLPAC) with a truly fascinating theme this year, “Rojak…Celebrating Diversity”. The announcement of ticket sales and unveiling of the concert poster took place today at Studio 5, KLPAC. Similar to the years before, the annual fundraising concert strives to touch the lives of underprivileged children by uniting talented youths from Singapore, Japan, Indonesia and Malaysia to raise funds for economically disadvantaged children whilst showcasing their skills. 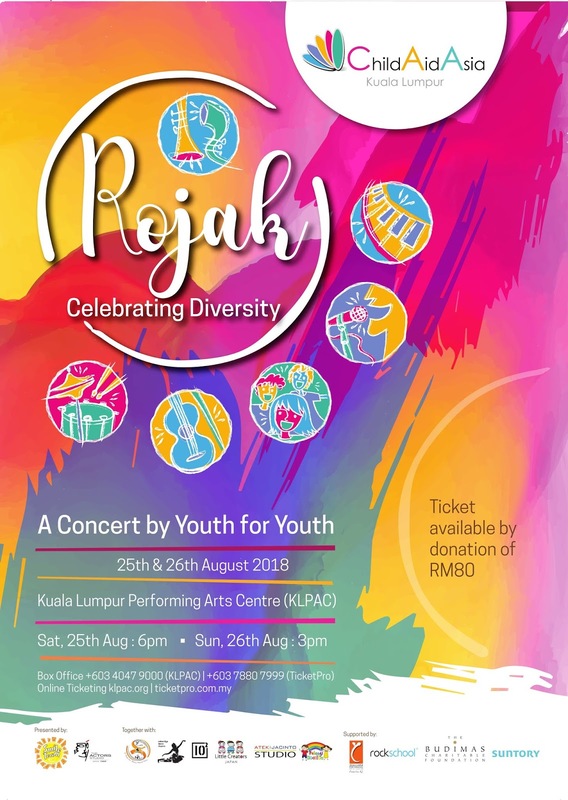 With a theme that exudes the definition of unity, Rojak will be celebrating diversity with a combination of music, singing and dance from various genres and cultures, proving that when people come together, they can move mountains and in this case, children making a change in the lives of other children in need. The concert is also designed to get young minds to work together and learn from one another. They also benefit from the sense of togetherness and friendships that are forged in the process. 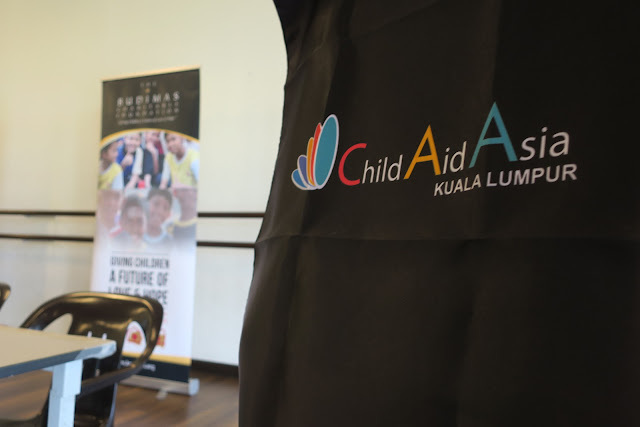 This year, The Budimas Charitable Foundation supports all the efforts of ChildAid Asia Kuala Lumpur by provisioning in various ways. “We as a non-profit that aids underprivileged children believes that every child deserves equal opportunities in life and we are here to make it more attainable for them. ChildAid Asia’s efforts are brilliant as they are able to provide a platform for musical talented children as well as those that have interest in performing arts the opportunity to develop their talent which will be valuable for their future,” said Anne Rajasaikaran, Principal Officer of The Budimas Charitable Foundation. CAAKL has also managed to form the ChildAid Asia Band (CAA Band) where this year it is expanded at the helm of an experienced musician to develop an enhanced platform for the beneficiaries. Besides that, CAAKL is collaborating with Mahavidya Dance Theatre which enables more young underprivileged and aspiring dancers to learn Bharanatyam as well as applying them with other music genres. 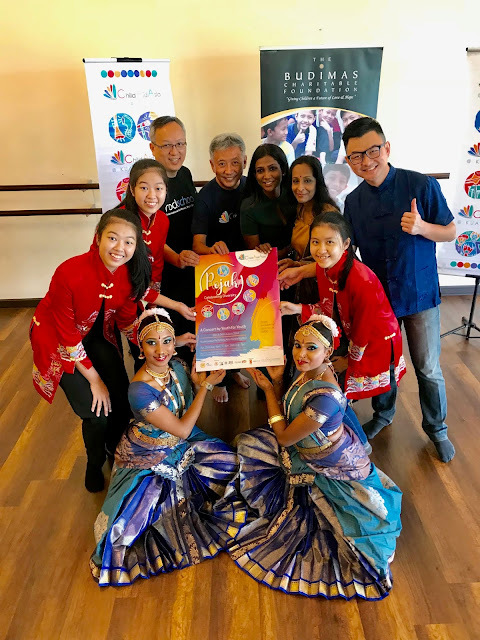 Another collaboration which is with Yi Xiang Ler Chinese Musical Centre also creates an opportunity for the less fortunate children to learn Chinese classical musical Instruments. Rockschool International, the international popular music organisation also came forward to show their support via special concessions and programmes for the less fortunate children. “Many generations in Malaysia grew up with BRAND’S® and Ribena® products and we are pleased to have helped bring happiness and wellness into our consumers' lives. It is with the support of our consumers that we are able to work with CAAKL and be one step closer to achieving our corporate vision of ‘Growing for Good’. 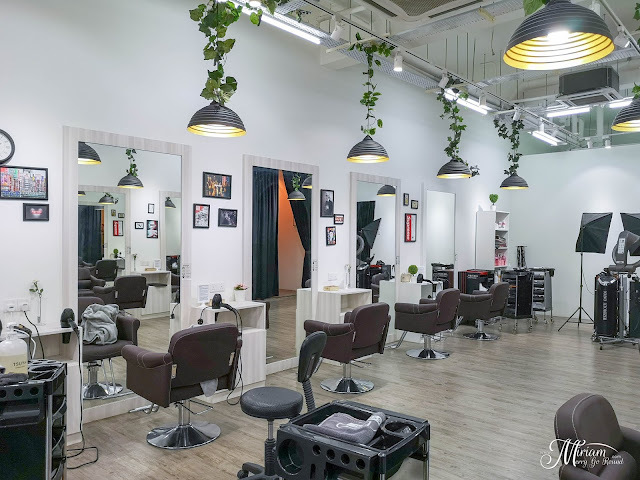 Our dedication to giving back to society goes hand-in-hand with CAAKL’s efforts in grooming a new generation of artistic talent. Much like this year’s theme ‘Rojak’, the exposure to and collaboration of different cultures at CAAKL also helps the children build up their communication skills and in turn strengthen their confidence, be it on or off-stage. We could not be more proud to make a positive impact on these young talents,” said Mr Kazuhiro Saito, Chief Executive Officer of SBFA. “We are truly humbled by the support we’ve gotten from various organisations today which has proven that the performing arts truly help children build self-confidence, express themselves, enhance their communication skill as well as provide an opportunity for them to use their skills and make a career out of it or even give back to the community,” expressed Ralph Lim, Founder of ChilAid Asia Kuala Lumpur. August 25 th and 3pm on August 26 th where ticket are available by donation of RM80. Time for another makan session with me. This time round, let's have it with a couple of tapas and drinks to match. 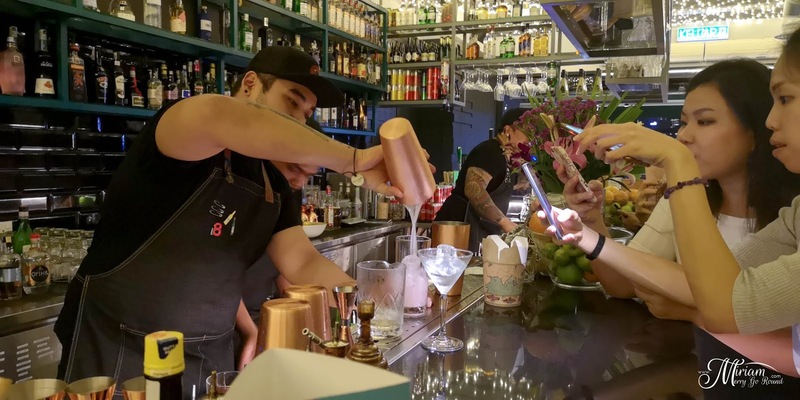 KNOWHERE Eatery, Bar & Cigars is a upcoming hit place to enjoy fancy tapas in Bangsar. 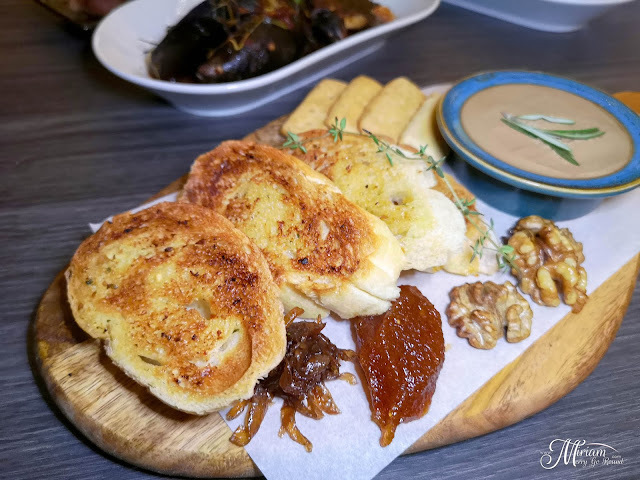 Located right smack in front of the main road, you will not be able to miss this French-inspired tapas eatery which serves interesting drinks too. Walking into KNOWHERE, the interior transport you to another dimension with the starry ceiling and wall art. Just opened last July, it is already making its mark as one of the must checkout restaurant bars in town. 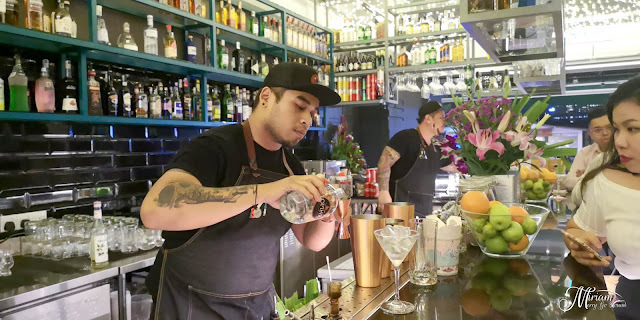 Their menu ranges from delicious tapas, pizzas, sandwiches, light bites paired with crafted cocktails and mocktails to match. During our visit to KNOWHERE, we were treated to an assortment of their finest dishes such as Duck Confit Pizza, Burnt Butter Steak, Grilled Calamari and more. 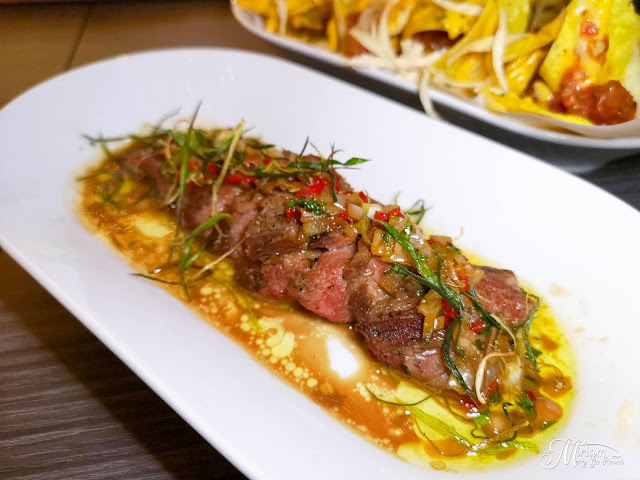 In the Tapas selection, my recommended pick has got to be the Burnt Butter Steak (RM26.80) where you will be served a juicy thick piece of sliced flank steak, well-seasoned and very tender. Seared medium rare, the juices ooze out and paired perfectly with their chili burnt butter sauce. 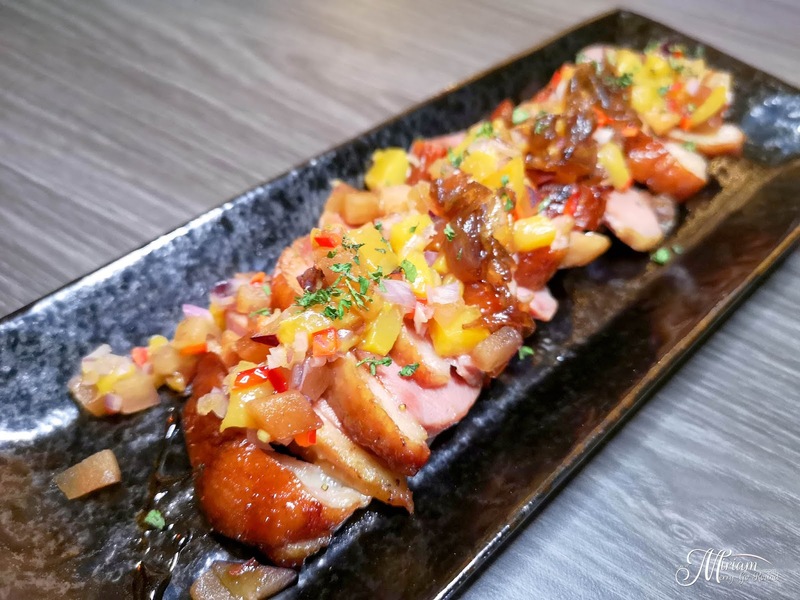 Their Smoked Plume & Plum (RM24.80) - House made Smoked Duck is also a mentionable dish as it is served with plum peach salsa, mango sauce and onion marmalade. How do you know if the dish is really good? It's when it disappears within minutes of serving. The side salsa and sauces really paired well with the smoked duck making it a enjoyable dish. 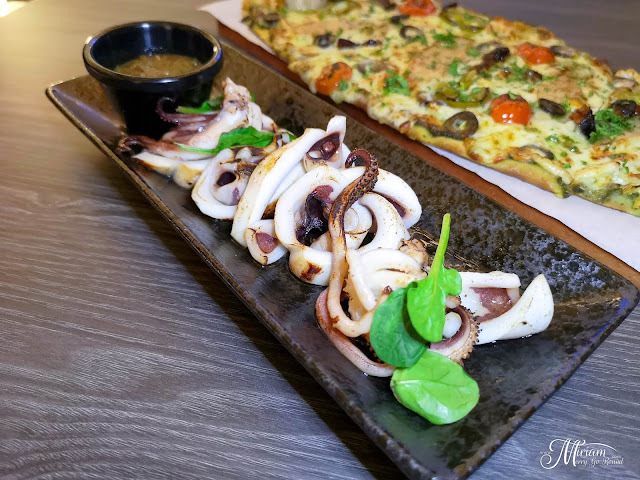 Moving on to the Grilled Calamari (RM24.80) which was pared with KNOWHERE's Signature Sambal Belacan Salsa, this dish would really make an impression. The Sambal Belacan Salsa hit the spot at the right note and was a fan favourite for the night. You get a hint of local flavor in the salsa which paired amazingly with the Grilled Calamari - well tender and not rubbery. Of course, when you out with the boys or girls having a drink or two, nachos are normally the crowd favourite. 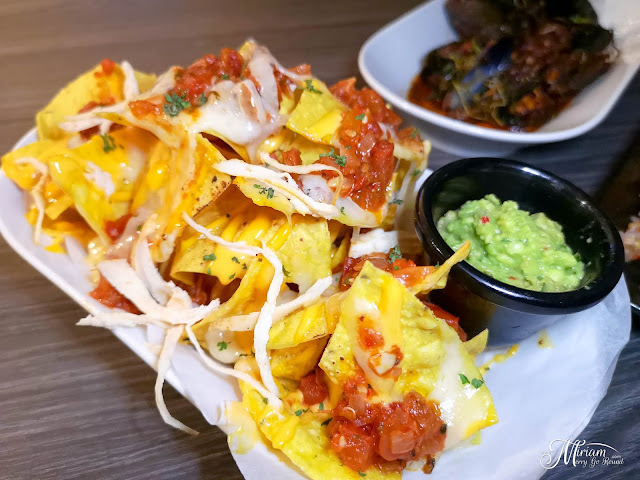 At KNOWHERE, their Nachos (RM26.80) has crispy fried tortillas topped with their special sambal guaamole, jalapenos, Month Jack cheese and pulled roasted chicken. Needless to say, it also got snatched up quickly. For those of you who love seafood, try the Mussel Sambal with Basil Lime (RM15.80). 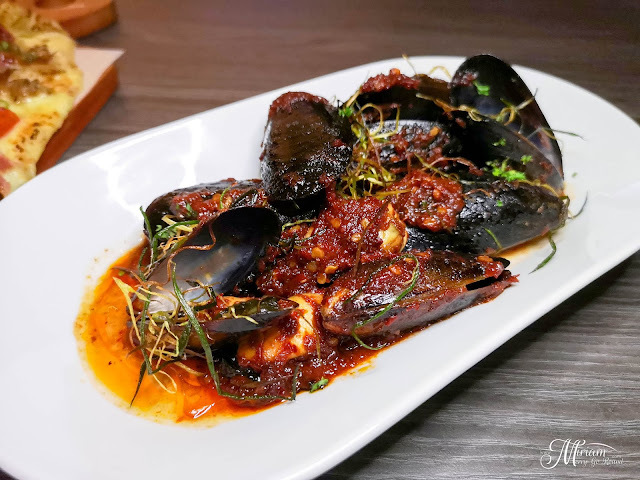 The Chilean Black Mussel is cooked in a mixture of basil lime chili and the signature sambal belacan salsa which gives a nice heat in the dish. I personally am not a fan of seafood but the rest of my companions enjoyed it well. But I have to say I loved the Chicken Liver Pate (RM15.80)! 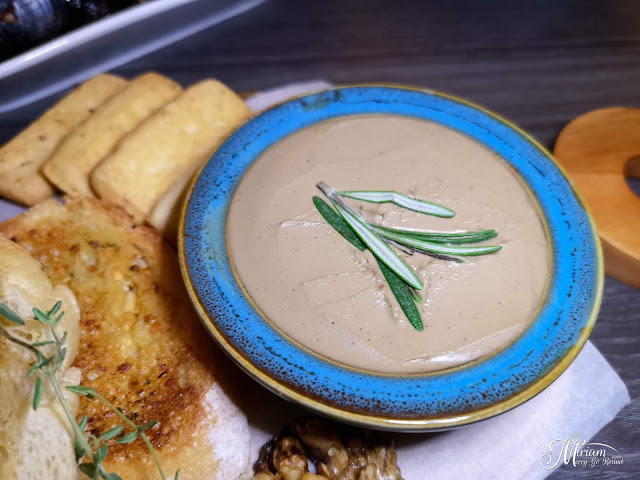 The house-made Pate was served with crackers, bread and jam and was delectable. If you are a fan of liver, you will definitely love this. Super creamy, well seasoned and just tastes so divine when paired with the sweet jam. My utmost recommended choice. 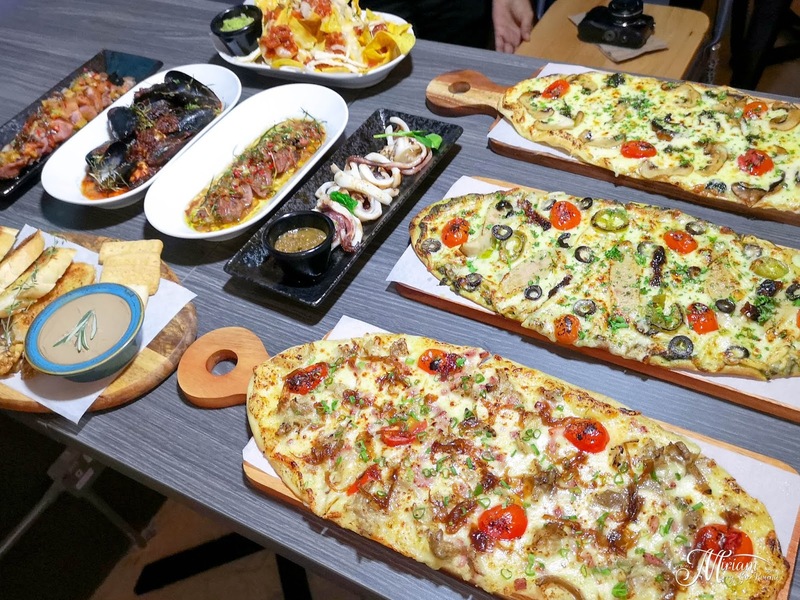 KNOWHERE also serves heartier options such as pizzas and they have a wide selection. 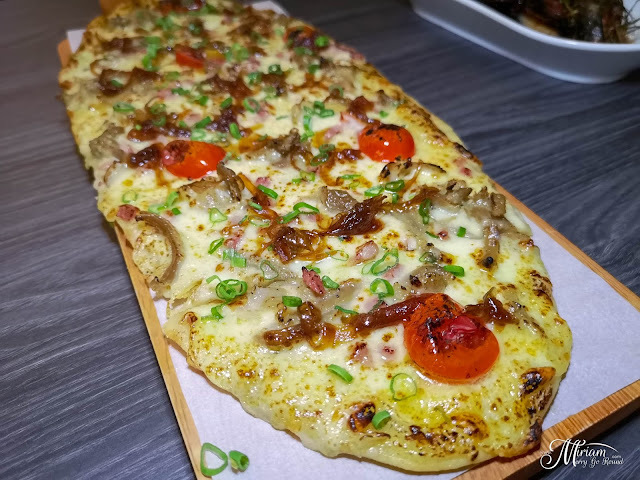 From the Duck Confit Pizza (RM36.80) which is a Flambe Style pizza topped with onion marmalade, confit onion and duck confit, it is an interesting type of pizza to savor. The base of the pizza isn't your regular pizza dough as it is made with fluffy sourdough which gives it a different bite and texture. Everything from the pizza base to the smoked duck and the sauces are all made in-house. 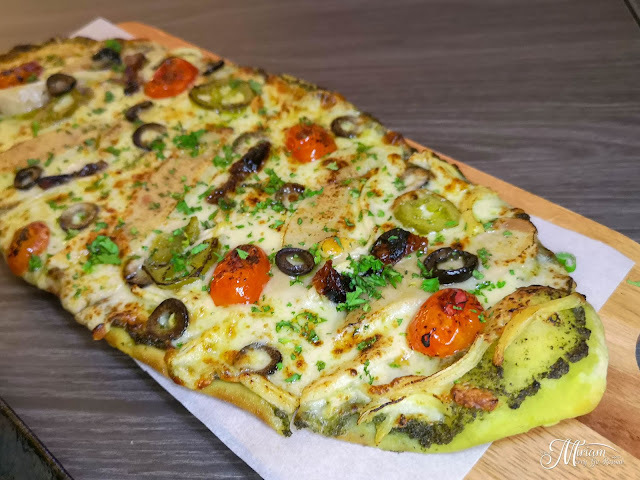 If you prefer chicken, get their Chicken Mexiana Pizza (RM28.80) - served with grilled chicken, chicken sausages, sun-dried tomatoes, jalapenos and olives. 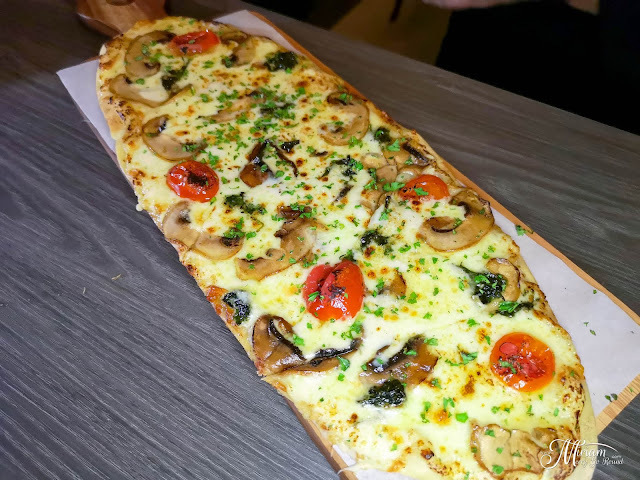 Or how about a mushroom party with the Al-Funghi Pizza (RM28.80), a vegetarian option which was topped with loads of wild mushroom and cheese. Once we're done with the food, let's talk a bit about the drinks section. I'm not much of a drinker myself and I was driving that night so I did not really get to enjoy their drinks. KNOWHERE bar greatly shoutout their list of original mocktails and cocktails. The drink list is nearly two pages long so you know you are well covered for drinks. 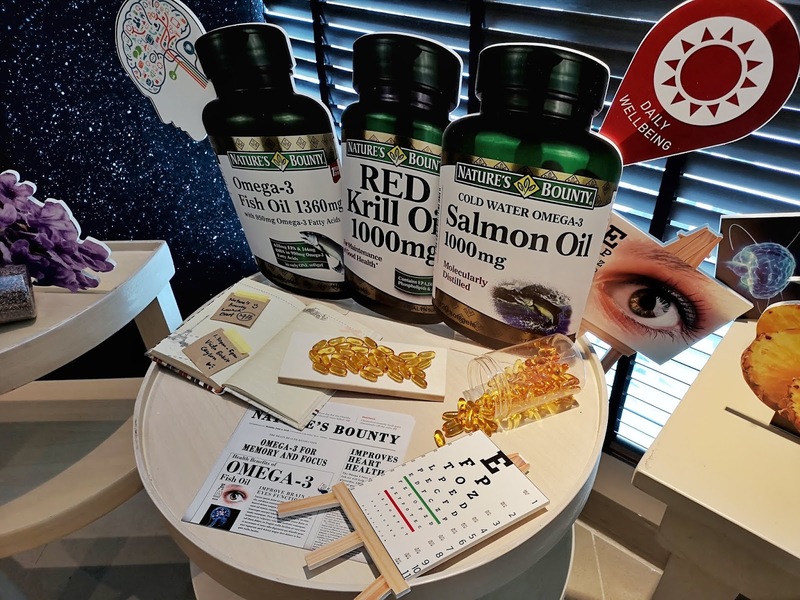 Presentation wise, KNOWHERE sure has us mesmerized. 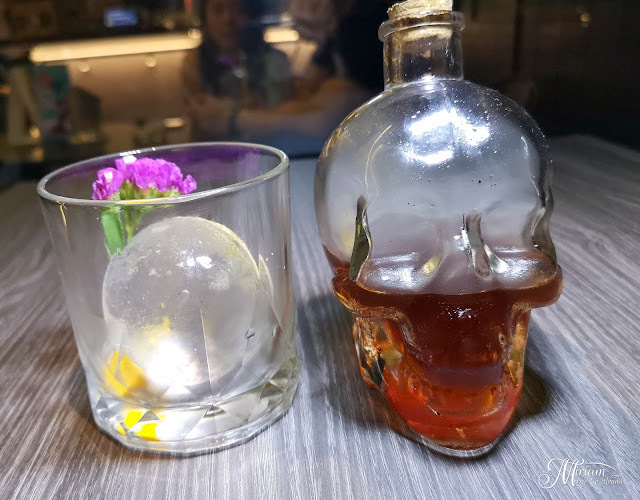 The Kopi Negroni (RM32) was served in a skull glass bottle and with an ice ball. It has Spiced Rum with Homemade Kopi Tongkat Ali Liqour and Kopi Hitam. If you plan to stay out all night long, this has definitely got to be the drink to go for. We also have the Smoked Popcorn Old Fashioned (RM36) and Sirap Setan (RM32) which both is really pretty. 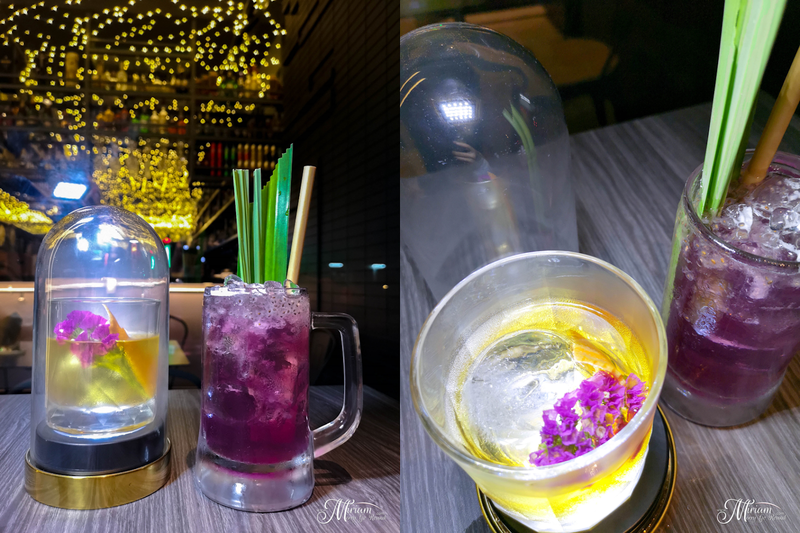 The Sirap Setan has Lemongrass & Pandan infused Gin with homemade rose water, cherry blossom & sours while the Smoked Popcorn Old Fashioned is Whisky stirred with popcorn syrup & grapefruit bitters smoked with in-house wood chips. How is August treating you? For those of you who are following me on my social media accounts (which you should), you'd probably notice that I had a hair makeover done a few weeks ago. I had jet black hair nearly my whole life aside from some color done a few years back. 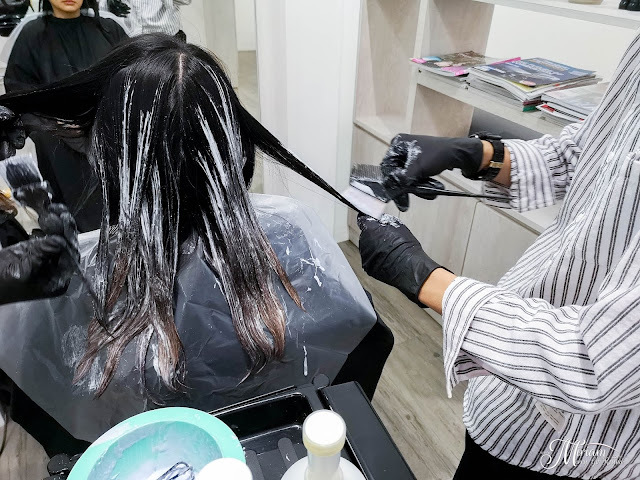 After growing out my previous hair color, I paid a visit to 90's Hairstyle, located at Sri Petaling to give myself some uplift. Many have been saying my black hair is making me look rather dull so off to the hair salon we go. 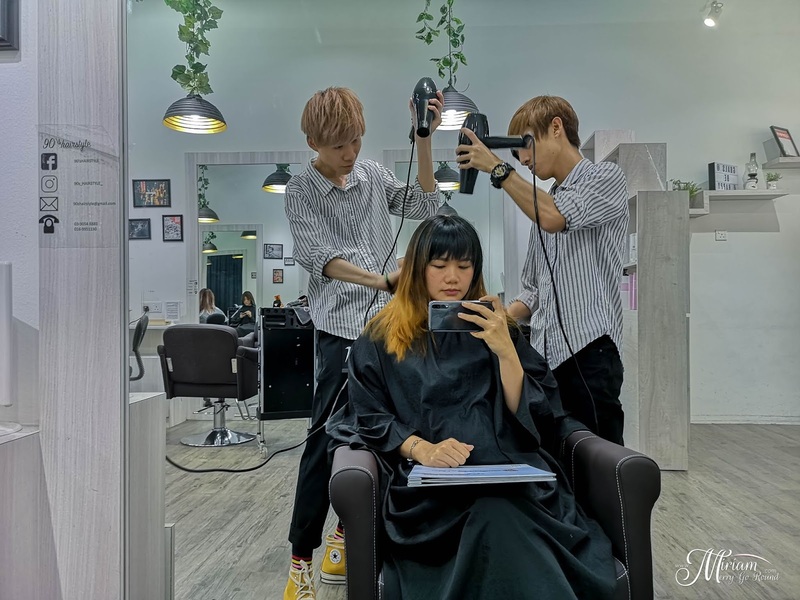 Located at one of the busiest parts of Sri Petaling, parking might be difficult but 90's Hairstyle do provide some empty parking spaces for their customers :) Walking into the quaint hair salon, I was welcomed by my hairstylist for the day. Jason has been working in 90's Hairstyle for quite some time and is experienced in providing the best service to their customers. 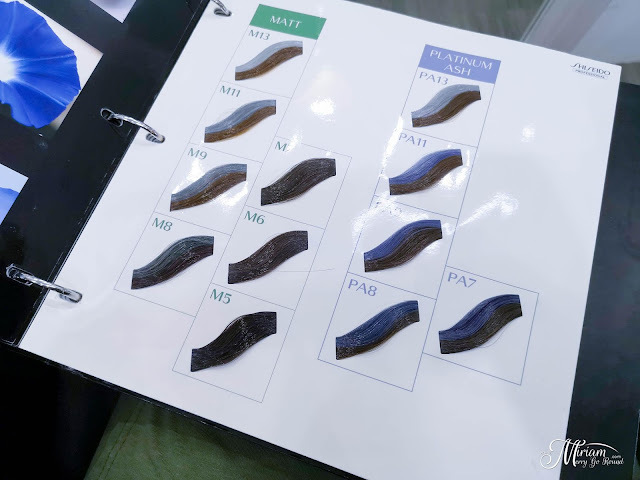 After assessing my hair condition, we went through several hair colors and discussed what would be best for my hair. I am not really a fan of bleaching my whole head plus I liked a hair color that was sustainable and didn't require me to keep going back for touch ups. 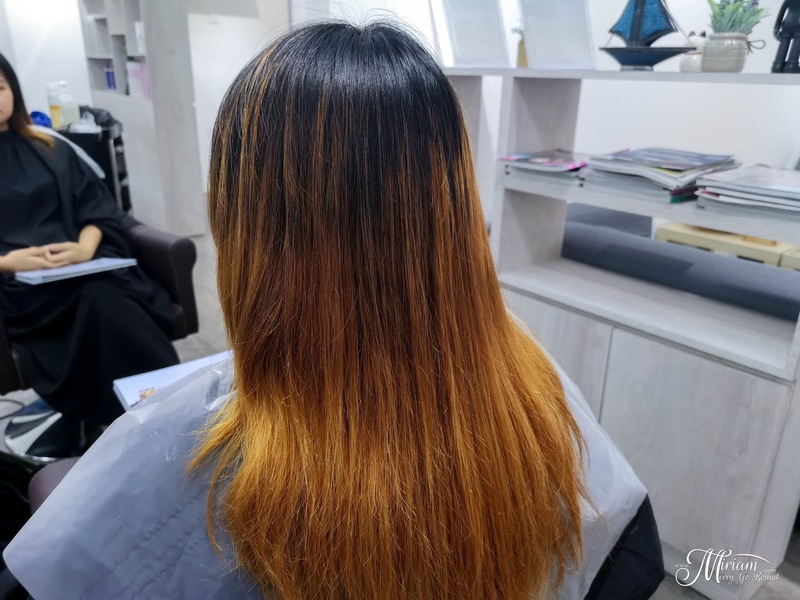 So, Jason recommended me only bleaching my ends to get a gradient look while maintaining a darker color on top. Honestly, I was very tempted to get like wild colors such as pink and purples but let's keep that for next time. 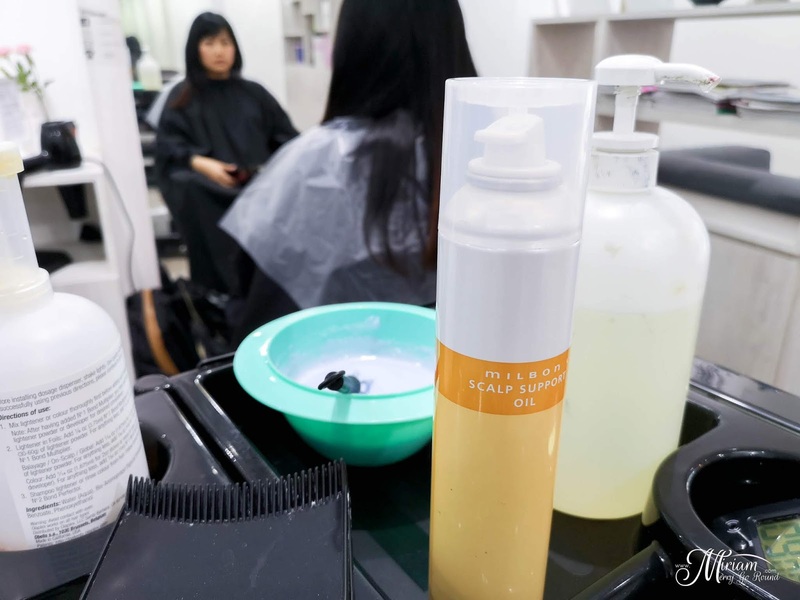 Before we start any work on my hair, the Milbon Scalp Protectant was sprayed on my scalp to protect it from the hair dye - making sure it does not get badly damaged. For those of you who suffer burns from dyeing your hair, this is what you totally need because it's like a safety protection layer for your scalp. 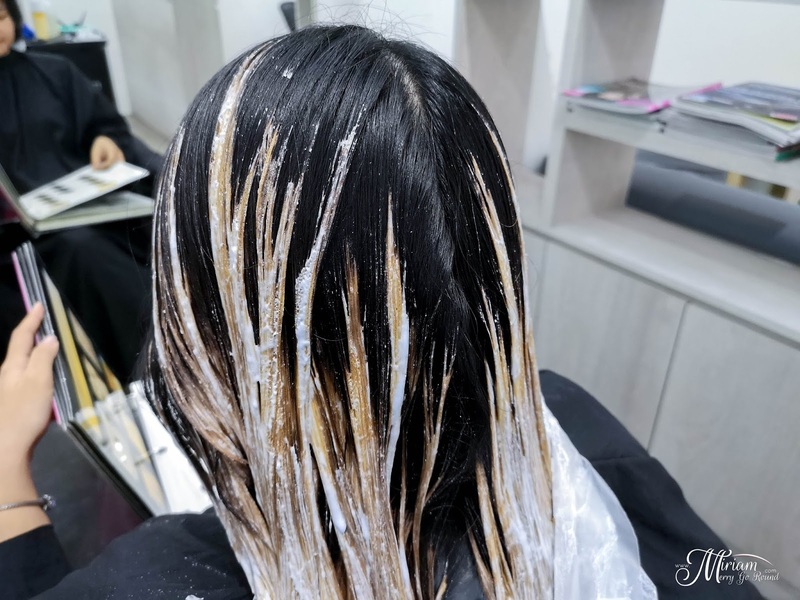 Next, my hair was sectioned and the initial bleaching and lightening begins. 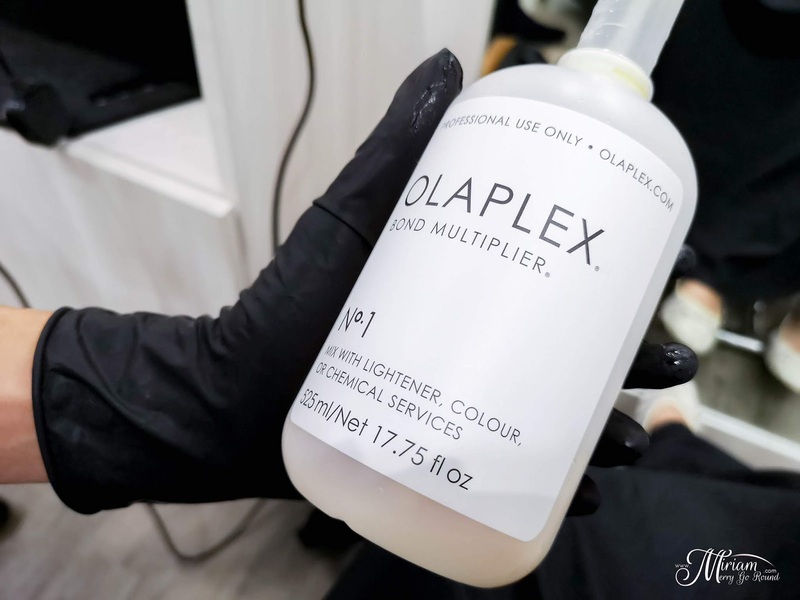 Throughout the whole process, OLAPLEX products were used on my hair. OLAPLEX is the leading 3-steps hair treatment system that can be used alone or with other services to restore compromised hair. For this step, the OPAPLEX Bond Multiplier was added into the mixture. 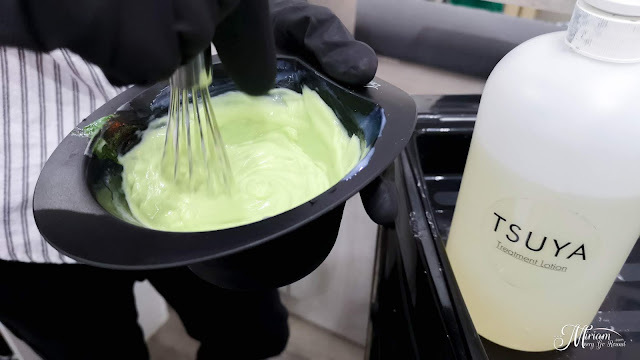 This helps to rebuilds the broken protein bonds in our hair to prevent further damaging from harsh chemicals when we bleach our hair. As you can see, they actually sectioned out parts of my hair to dye it and create a more subtle gradiation instead of full-on bleach. This will help create highlights in my hair and make the two toned color much more natural. Next, to speed up the process and help the bleach do it's job - a heater was used which feels like a mini sauna session for my hair. 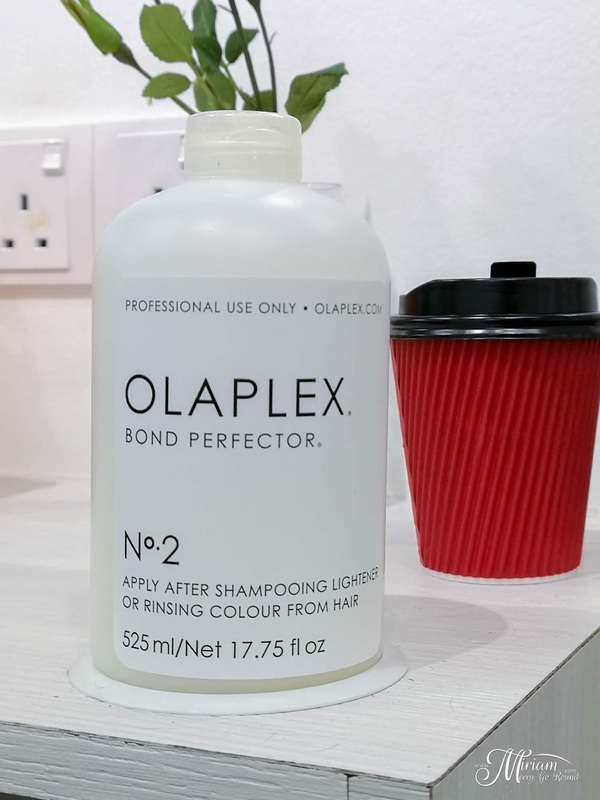 It was then time to wash out the bleach and after washing out the bleach, OLAPLEX Step 2: Bond Perfector was used. 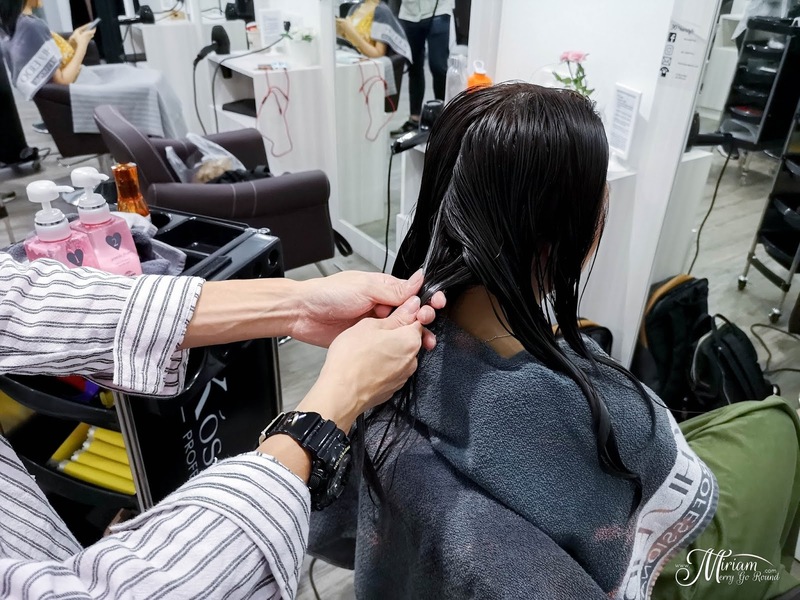 The second step works like a hair treatment where it continues to rebuild and restore any remaining broken bonds. 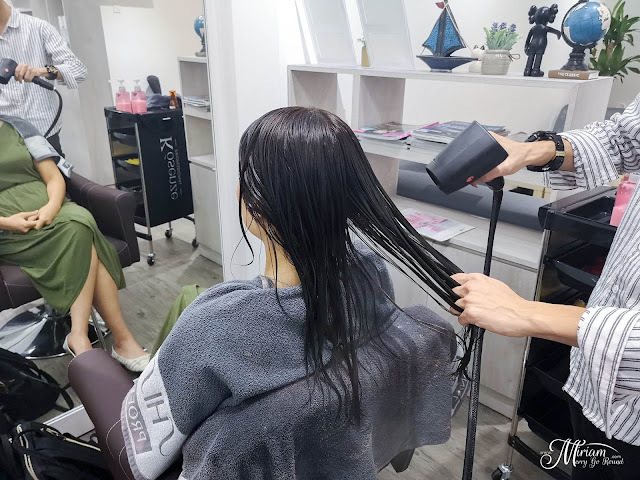 This will help your hair to be stronger, shinier and healthier at the end of the treatment. 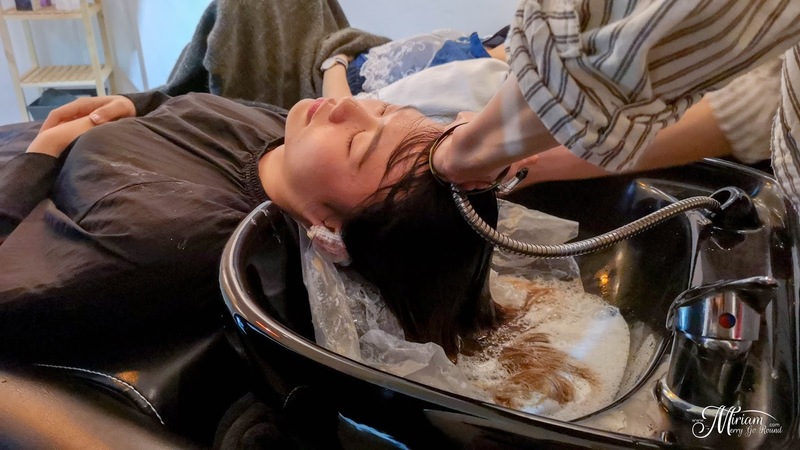 The whole treatment was so comfortable because who doesn't love a nice hair wash and massage? Next up, it was time to blow dry my hair and here's the end result just after the bleach. Honestly I was surprised by how bright the color was but you can see how there are different shades in my hair. My hair after the wash was also soft and not dry like I expected. Must be thanks to the OLAPLEX treatments. While I was still digesting my hair color, it was time for the real hair transformation to begin. 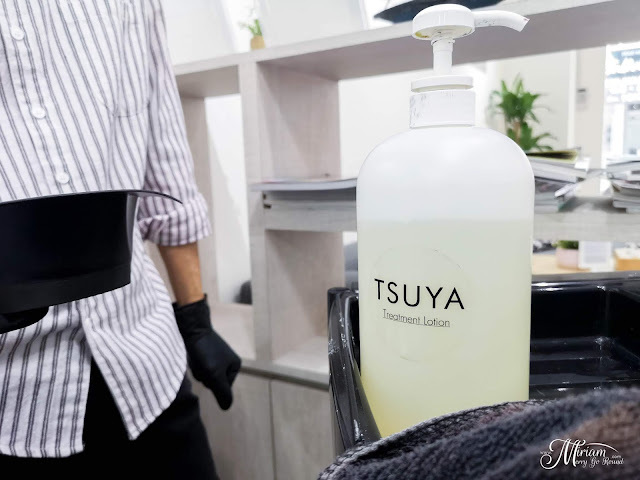 Tsuya hair treatment lotion was mixed into the dye mixture. TSUYA hair treatment works to replenish moisture back to our hair with the high content of amino acid and hyaluronic acid, fused with 100% natural collagen powder. This helps with frizzy hair and tangled ends plus can also strengthen our hair. 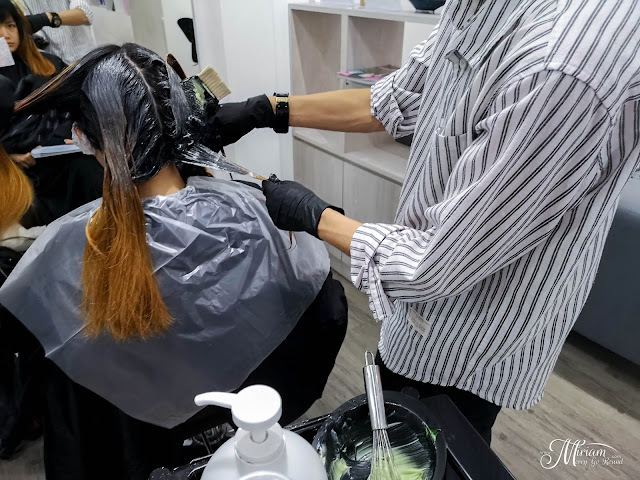 Just a few drops can help the hair color last longer on the hair. Just like before, the hair dye was applied carefully and I noticed there was minimal contact to my scalp. 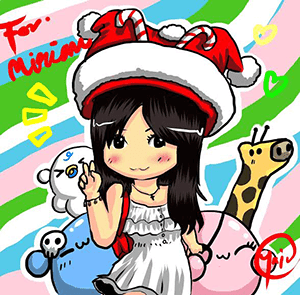 Throughout the whole process, I did not notice any burning sensation like what I experienced before. The hair dye was left to set for a few minutes before it is washed off. 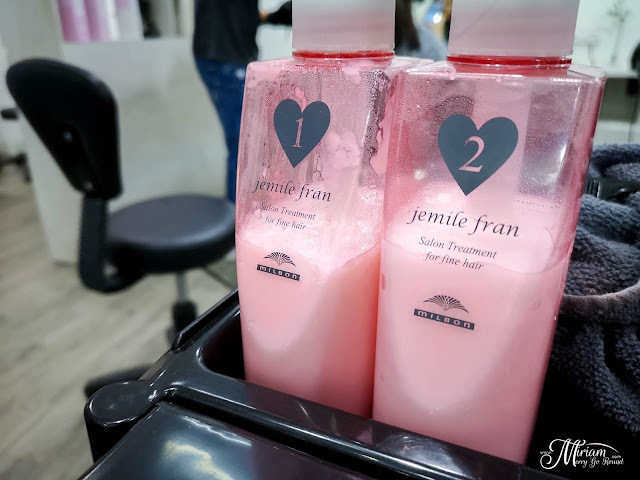 Jason also used MILBON jemile fran hair treatment to my hair to add in back moisture and shine. 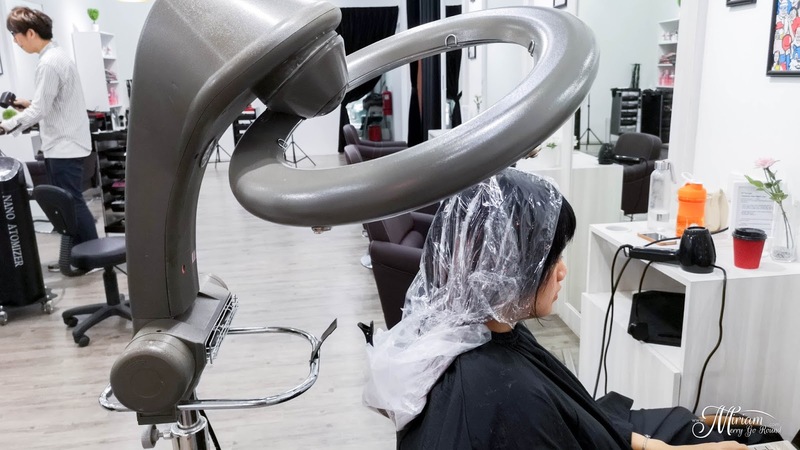 This treatment is designed for busy people because it takes super fast to treat back any damage hair. This two step treatment takes about 30 minutes and leaves you with soft and manageable hair. 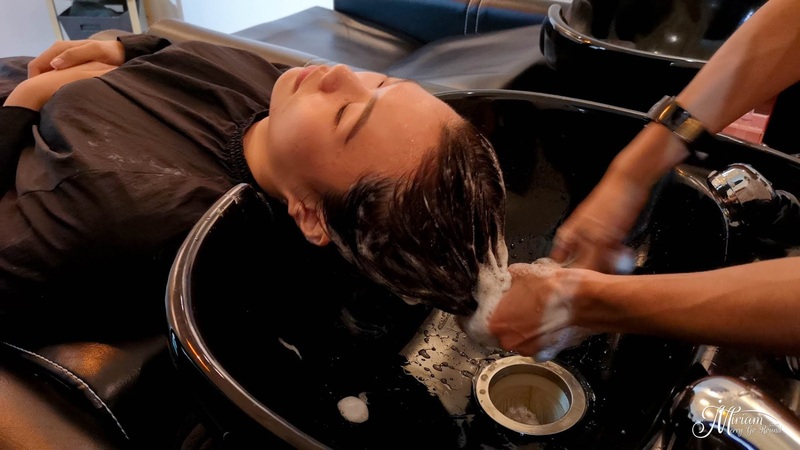 The first treatment is a wash-off treatment and the smell is really fragrant and soothing. I nearly fell asleep while my hair was washed using the first treatment. 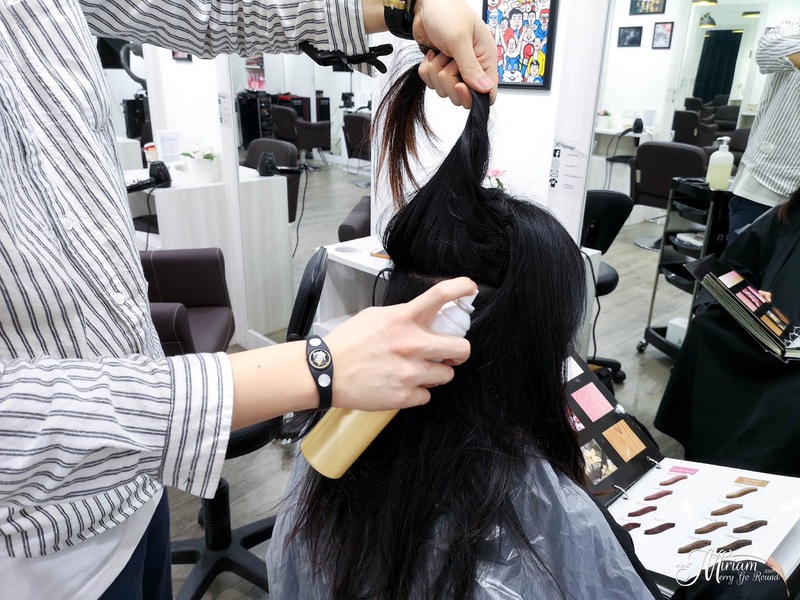 For the second part, it was slowly massaged into my hair strands using a special technique. Then a Nano Mist was used to seal in the moisture and the treatment. My hair turned out looking shiny and healthy after the whole process even after bleaching and dyeing. Here's the end result of the hair makeover from 90s Hairstyle! 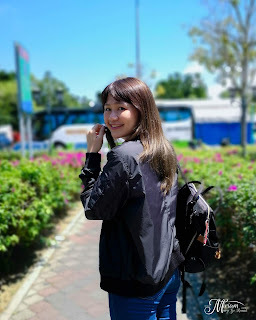 This was actually one day after my makeover when I was en-route to Singapore. Mind you, it is recommended not to wash your hair at least 2 days after dyeing so that you can retain the hair color longer. 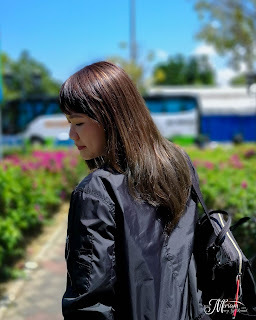 Surprisingly, my hair which I normally have to wash every day was not oily and maintained looking fresh even during the second day. 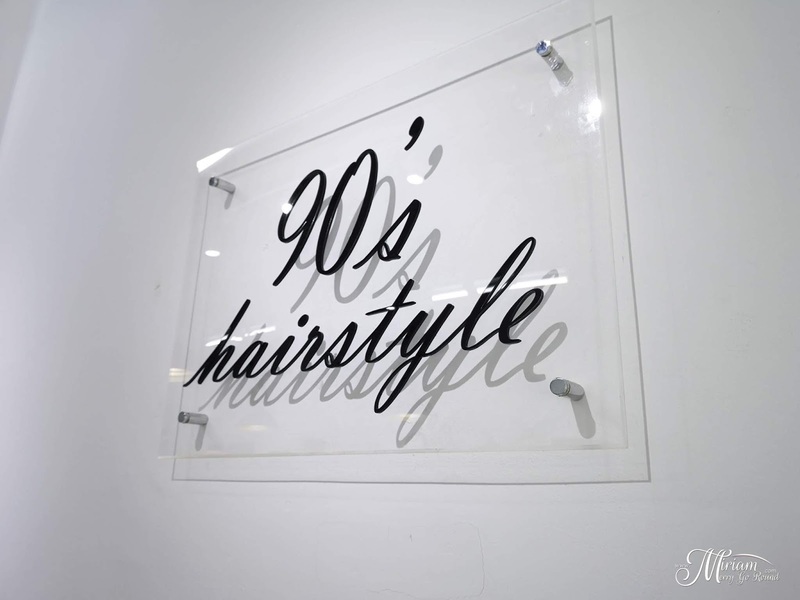 90's HairstyleAddress: No. 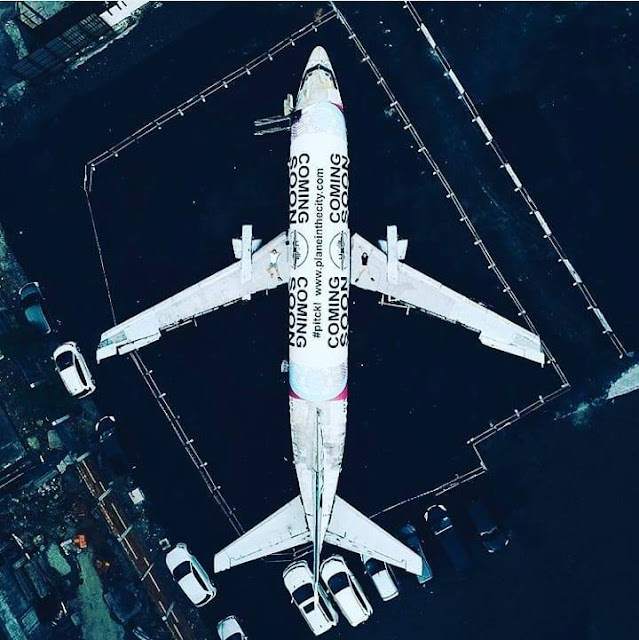 8, Jalan Radin Bagus 6, Bandar Baru Sri Petaling,57000 Kuala Lumpur.